An Angry, anrgy man . . .
Just look what you’ve done, Obama. It’s all your fault. I’m an angry, angry man. Thomas Merton. Love and Living. Naomi Burton Stone and Brother Patrick Hart, editors. New York, Farrar, Straus & Giroux, 1979: 176-177. Flip Flop, flip flop. 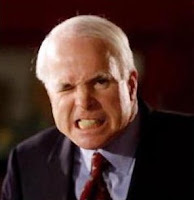 . .
McCain doesn’t want to debate. 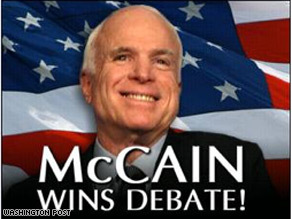 McCain will debate, if Bailout passes. McCain still doesn’t want to debate. McCain wants to postpone the VPs debate. And not only will he debate, he has already won a debate that hasn’t yet taken place. The debate is at 9:00 ET. And this is leadership. Okay. Question: Do you see racism in this poem? If so, explain briefly. BTW, William Blake, an English pre-Romantic, is one of my favorite poets. I just read a beautiful, healing poem on Autumnrose’s blog. Then I saw Karen’s rainbow pictures. “When God took on flesh in Jesus Christ, the uncreated and the created, the eternal and the temporal, the divine and the human became united. This unity meant that all that is mortal now points to the immortal, all that is finite now points to the infinite. In and through Jesus all creation has become like a splendid veil, through which the face of God is revealed to us. “Do you want to know God? Then learn to understand the weaknesses and imperfections of [others]. But how can you understand the weaknesses of others unless you understand your own? And how can you see the meaning of your own limitations until you have received mercy from God, by which you know yourself and Him? It is not sufficient to forgive others: we must forgive them with humility and compassion. If we forgive them without humility, our forgiveness is a mockery: it presupposes that we are better than they. Thomas Merton. No Man Is An Island. New York: Doubleday and Company, 1955: 163.
not ones of racial salvation. It is a beautiful day, the day the Lord has made. Be glad today. It’s all about the ordinary, the unspectacular, isn’t it? That’s where you always find wonder. Melissa tagged me, so I will do it. 1. My middle name is Rae, after my Dad, whose middle name was Ray. 2. I love the soft texture of apricots. 3. I have never lived alone. 4. Eggs are about the only food I will not eat. Ever. 5. In the 39 years since Bill and I got married, I’ve had four cats but no dogs. RG, Jana, Karen, Clare, Sherry, and Mike, you’re It.